The spot markets have started their annual transition away from winter-spec gasoline to summer grades. Wholesale racks will be next. What do we mean by that? We mean RVP levels. RVP, or Reid Vapor Pressure, measures gasoline pressure and is mandated to specific levels by state and local governments as an ozone-control mechanism. In warmer months, RVP levels must be lower than when it’s cold outside. In late winter/early spring each year, U.S. spot gasoline markets start to ramp down RVP with the chain reaction rippling to the racks. 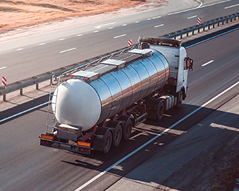 The spot market starts the RVP transition so that the proper grades can be loaded from refinery hubs into pipelines and supply the United States’ extensive network of wholesale fuel racks. Low RVP designations then start to appear in OPIS rack reports. 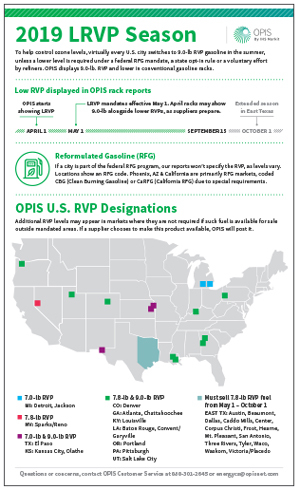 Download this free infographic to see when, where and how OPIS is handing RVP changes in 2019. As 9.0-lb RVP-and-lower levels take center stage, spot gasoline prices can bounce around. RVP season tends to keep gasoline on its toes, so to speak. It’s not uncommon to see double-digit price bounces. Refiners increase or decrease their daily rack costs based on the average daily change in their spot replacement cost, a value they calculate based on changes in the spot market. So, a 10ct change in the spot market based on RVP changes will be felt at the racks. The market will, of course, transition up again in the fall. And you'll be able to keep track of all the changes in your OPIS Rack Report. If you aren't already subscribed to OPIS Racks, learn more about OPIS rack pricing or click below for a free demo.